"All my tools, my tractor, everything is gone," Jim Sherbourne said. "It doesn’t matter. These guys matter"
On the morning of Nov. 8, Jim Sherbourne’s evacuation order didn’t come from authorities. 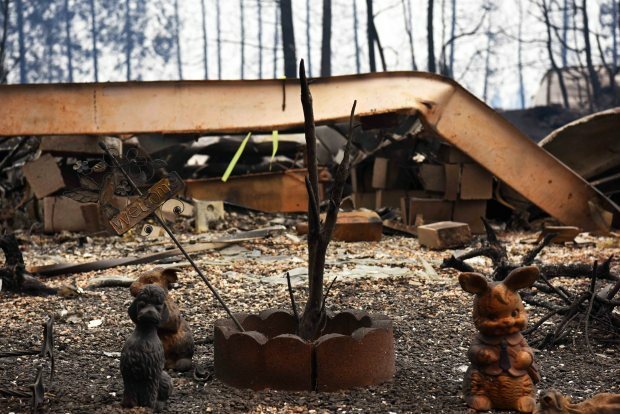 As the flames of the so-called Camp Fire, which became California's deadliest, raced toward Sherbourne’s house in Concow, it was his 2-year-old German shepherd, Jake, who woke him up in time to escape. 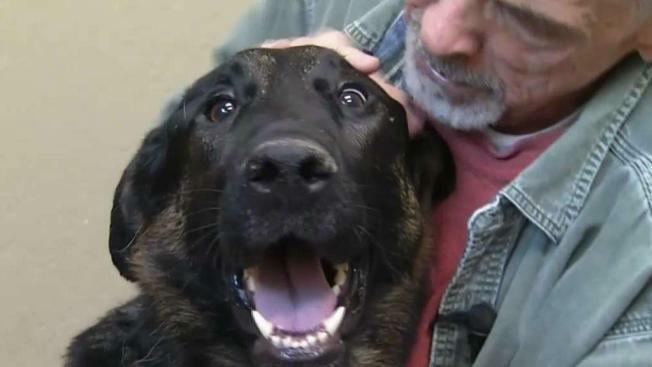 But after days of breathing the smoky air in Butte County, Jake had to be rushed to a veterinarian in Concord. Sherbourne lost his home and came close to losing his beloved dog, too. But the two were reunited Tuesday. "He woke me up. I thought it was a bear," Sherbourne recalled. "He looked at me kind of dumbfounded, and the glow, I'd just seen the glow behind me." Sherbourne grabbed four urns that held the ashes of his other dogs and took off with Jake and two older German shepherds. "All my tools, my tractor, everything is gone," he said. "It doesn’t matter. These guys matter." Sherbourne then had to give up his dogs for a brief time to a shelter in Oroville. His vet said Jake was too big to be indoors, so he was left outside for days at a time. The toxic air and pneumonia nearly killed him. Since the Camp Fire broke out, Jake has lost 40 pounds. His vet says if Jake had not received medical care, he would have died. "He was on many, many days of oxygen therapy," said Micki McCabe of the Sage Veterinary Center in Concord. That intensive care isn’t cheap. Sage Veterinary Center agreed to cap the bill at $11,000. Now Sherbourne is figuring out how he’s going to come up with the cash to pay that bill. That’s where the nonprofit Bay Area German Shepherd Rescue stepped in. They created a GoFundMe campaign for Jake’s vet bill, and in just over three days, donations topped $12,000. "If we can help, we can always try to help," said Susan Hsu of the rescue center.